It's been quite a few years since I made a New Year's resolution. The times that I did, they were almost always the typical empty promises to lose 10 pounds, exercise more, become a morning person (that one is particularly hilarious), or eat less junk food. I would generally start off with a bang...until the first opportunity arose to send them flying out the window (usually sometime mid-morning on January 2nd), at which time I did exactly that. 2013 was a year of reflection for me. I probably owe a majority of that to my writing as I now spend a lot more time "in my head". In response to all I have learned about myself in the last 12 months as a result of my "reflecting", I have decided to bite the proverbial bullet and make a resolution for 2014. 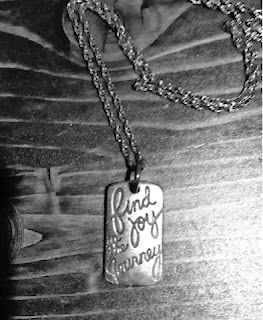 A couple of months ago I came across a silver pendant with an inscription that read, "Find Joy in the Journey". I rarely purchase jewelry of any kind for myself, but I bought it. I wear it on a necklace and it is the first thing I see when I look in the mirror each morning. I will be content with who I am. Not to be confused with complacent, as there is always room for becoming a better me. But I will work to do just that...become a better ME. I will NOT strive to be someone else. I will stop comparing myself to others. I will not allow someone else's life or achievements to minimize the significance of mine. The only person in control of that is me and, as Theodore Roosevelt once said, "Comparison is the thief of joy". I mustn't steal my own joy. I will feed the relationships that bring me happiness, and walk away from the ones that don't. I will remember the serenity prayer and the part about things that are out of my control. And I will let them go. I will stop beating myself up for the times I "fail" at parenting. Some days I will yell and some days I will pack sugar and preservatives in my children's lunches and some days I will let them watch television for 4 hours straight. Some days I'll spend too much time on my phone or my computer. I will take those days for what they are and then I will rejoice in the other days. The ones when I don't do any of those things and instead have a myriad of parenting "wins". The days when I cook homemade meals and play at the park and read bedtime stories. And regardless of which kind of parenting day I have, I know that each night I'll tuck my kids into bed with a kiss and a hug and they will have no question as to how immeasurably they are loved. I will be mindful of my health and my body, but I will stop worrying so much about what society says my "outer self" should look like. I will be okay with the fact that I may no longer wear a size 2 4 6 (You get what I'm saying. P.S. I've never been a size 2.). I will spend more time working toward becoming an extraordinary person in what most would consider an ordinary body rather than the other way around. This is probably the hardest resolution I've ever made. It is also one that will, no doubt, need to be re-resolved year after year. 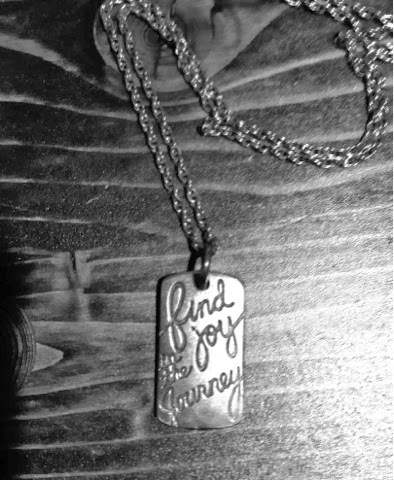 So, friends, whatever your resolution for the next 365 days may (or may not) be, my wish for you is that you will find joy in your journey. I love it! Joy is so important, and yet so many of us are missing it from our lives. My resolution is balance. On e word, which impacts my whole life. Once I feel balanced, the joy should be easy to experience. I'm not a big fan of New Year's Resolutions (partially because anything in caps can't be good), but I really, really like this one. I'll give it a shot. These are good goals. Now you can practice not comparing yourself with others by joining my mom on Fitbit cuz I heard her tell dad that you were scared when in fact there was nothing to be scared about. I have no idea what she was talking about. Beautifully said! Thank you for sharing those thoughts in your head! The only person in control of that is me and, as Theodore Roosevelt once said, "Comparison is the thief of joy". I mustn't steal my own joy. I stopped making resolutions after I realized I had the same resolution ten years in a row, "Don't Eat Sugar." I kept the sugar and just lost the resolutions.